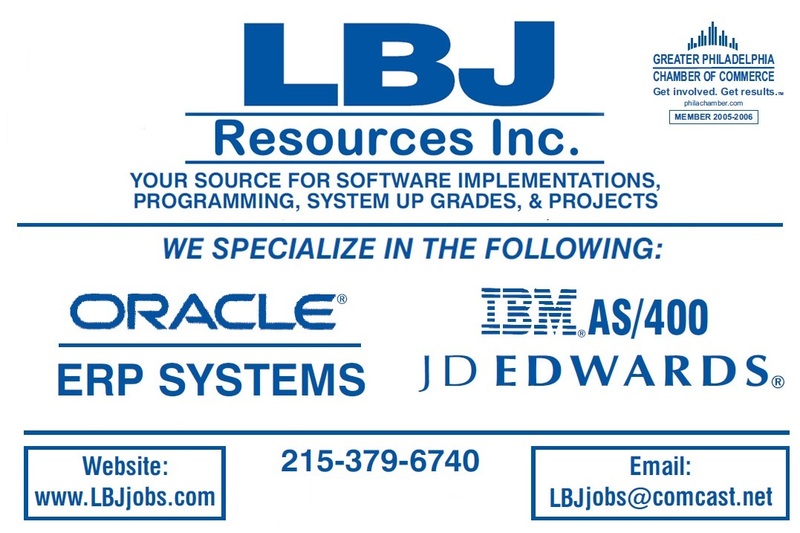 LBJ Resources, Inc. Specializes in the Following: JD Edwards, IBM I Series, SAP, Oracle, Lawson, Lansa, Cisco, Unix, Linux, Microsoft, Lotus Notes, Developers and Administrators, ERP, CNC, Mapics, BPCS, Infinium ,PKMS, PRMS, Systems Administrator, Island Pacific & EDI products. We have an outstanding reputation in the Executive Placement and Consulting business. We can handle anything in your Information Technology Structure. LBJ has been endorsed by the Better Business Bureau of PA , Philadelphia Chambers of Commerce, Quest International Group and the Philadelphia Magazine. LBJ Resources,.. Has instituted a four-day workweek onsite, allowing consultants to come back to the office and finish their Work or go home for the weekend, always completing their work on time . Here are some True Endorsements from LBJ's high-powered clients: Milton Hershey School, Bed Bath & Beyond, Hallmark, Crayola, Fishman &Tobin, Quaker Chemical, Teva Pharmaceutical, DTCC Financial, Toll Brothers, Chase, Victory Energy, TV Guide, Hilton Casino, Trex and there are so many More. LBJ will only use the "American Team" on all Projects & Up Grades; LBJ never uses NON–CERTIFIED Consultants. With "ERP" Projects. LBJ WOULD LIKE TO EARN YOUR BUSINESS!! !